Let’s face it; Lara Croft is every gamer’s favourite heroine. If she isn’t, it’s probably because you’ve never played a Tomb Raider game before. If you haven’t played a Tomb Raider game before then where have you been for the past seventeen years? When I was a child my parents allowed me to play two games on our old Windows 95 PC. Those two games were Worms and Tomb Raider. I can remember countless evenings where my brother, my dad and I would play Tomb Raider together – trying to guide Lara through the various ruins and temples like a female Indiana Jones. So, when I heard that Square Enix were planning on rebooting the franchise I was, understandably, a little skeptical. I had felt for a long time that the Tomb Raider series had fallen from grace. Tomb Raider Legend, Anniversary and Underworld were much of the same. Sure, they were good games, but they weren’t offering anything new. 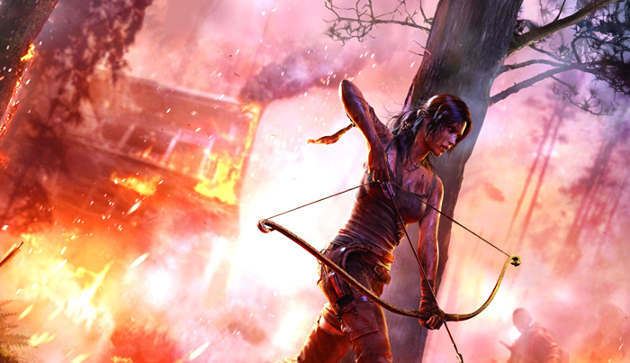 Square Enix promised to do just that, to reboot and re-brand the Tomb Raider game series. Well, reboot and re-brand they did. Tomb Raider is technically a prequel to the original series. 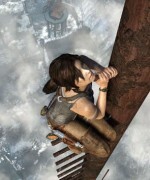 The player will control a young Lara on one of her first adventures. It’s here, on an isolated island in the Dragon’s Triangle, that you will experience the transformation of a vulnerable Croft into the heroin that we all know and love. Admittedly, the game starts slowly. It feels much more like a blockbuster movie than it does an interactive playing experience – there are a lot of button mash sequences. Though I must say, it’s done with style. But it’s once the first half an hour of the game is complete that Square Enix really picks up the pace. The opening half an hour really sets the tone for the game. Lara’s first adventure is a battle for survival – and she’s really not having a good time of it. Combat was always a problem for Tomb Raider games. There was no real cover system, the weapons were simple and, in most cases, unrealistic. This title has been heralded as an overhaul – well, combat has well and truly been overhauled. 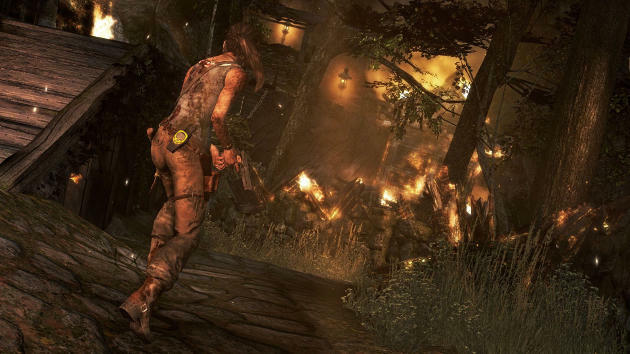 Lara will now automatically seek cover when near it, crouching behind logs, walls and boxes is simple and effective. The firearms themselves are easy to use but their simplicity doesn’t take away from the fun of armed combat. Lara won’t actually touch a gun for a good chunk of the game, favouring the bow in the early stages of the story. Even towards the end I still found myself edging towards the bow in combat. It was simple to use but gave a huge amount of satisfaction, especially when getting a clean headshot from a fair few feet away. Lara starts the game with little to her name, by the end of it the player will have a full arsenal at their fingertips, from shotguns to assault rifles – have no fear, even Lara’s patented double pistols will rear their silver heads at some point in the game. This is no normal action-adventure game. It will take over an hour of game play before Lara will get the chance to take on a baddie. Her first kill is a moving experience, the mild button bashing fades into the background as you watch Lara fight to out muscle her attacker and then struggle to come to terms with her actions. The whole sequence is brilliantly voiced by Camilla Luddington (aka Lara Croft) though, I must admit, she does a fantastic job throughout the entire playing experience. Her portrayal of Lara is so diverse that you truly feel like the Lara at the beginning of the game is not the same person by its conclusion. This was clearly Square Enix’s objective and Camilla performed it to perfection. The heavy focus on Lara’s character development does draw something away from her supporting cast. Her friends and enemies seem just that, supporting characters in the Lara Croft show – but that was to be expected. 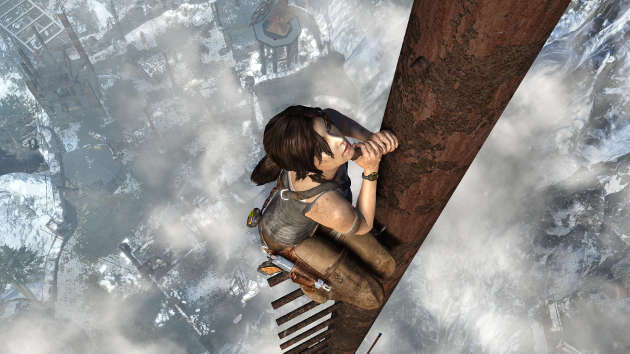 At no point does Lara seem incapable of rescuing her friends and uncovering the truth. This was the real triumph of the game. I felt myself sympathizing with Lara on her grueling challenge, my heart bled when I couldn’t push Y quick enough and she ended up speared on a lump of metal or crushed by a falling boulder. Lara never seemed weak; she just seemed incredibly real – a welcome change from the somewhat robotic Lara of old. Lara’s transformation is relatively hands on. The player will earn experience whilst completing challenges, missions and killing enemies – this XP can then be redeemed to upgrade Lara with various different skills. These skills will enable her to become a hardened survivor, but the path she takes is up to you. If you play a quiet game, stalking around in the shadows and picking off enemies from afar, then the skills will cater for this. If you prefer running in, guns blazing and pick axe waving, then the skill tree will make those dreams a reality. These skills can all be utilized by Lara’s ‘survival instincts’. With the push of a button Lara will scan the surrounding area, highlighting any areas of interest – rock faces that can be climbed and boxes to loot. Her survival instincts can be upgraded so as to highlight objects further away, animals to hunt and tombs to explore. This is an incredibly useful addition to the game, especially when there are multiple methods of reaching your objective. Just like any good Tomb Raider game, there’re plenty of opportunities to – you guessed it – raid tombs. I mean, it’s not called Tomb Raider for nothing, right? These incredibly detailed areas of the game are both easy and difficult to find, depending on the tomb. They range from ancient burial tombs to grand temples and world war two bunkers. Each has its own challenge, often with a puzzle or two to be solved. This is where Square Enix drew on Tomb Raider’s rich heritage. Exploring these caves and ruins reminded me of my childhood – though they’ve done a fantastic job of making them much more interactive and beautifully presented. The game itself looks and sounds incredible. Vast, magnificent mountain ranges are broken up by dark dank caves and thick, spanning jungle. The occasional drip of water echoing through caverns or the howl of a wolf in the wilderness adds an eerie realism to this already realistic game. It’s difficult, near impossible, to highlight a place that this game stumbles. However, it’s not completely impossible to find faults. The online multiplayer is, well, unnecessary. It’s not that it’s bad, far from it, it’s relatively enjoyable. The reason that it’s unnecessary is because it isn’t anything new. The multiplayer experience feels like that of most games that have an online aspect thrown in on the side. It doesn’t make the game any better, though it doesn’t make the game any worse. The game mode ‘Rescue’ is rather enjoyable. It’s a different take on the ‘capture the flag’ game mode that most titles seem to sport these days. One team must grab med-packs to save their injured friends whilst the baddies must, well, kill them. It’s simple, but effective. The other game modes – ‘Team Death match’ and ‘Free-for-all’, are samey. Online multiplayer offers a wide range of characters to play as, lots of new weapons to use and some fun maps full of traps and snares to trip you up. It also includes a level-up system for player progression and online ranking. There’s nothing new or innovative here, much unlike the campaign – but it’s understandable. Tomb Raider is, without a doubt, a fantastic game. To be honest, the word ‘fantastic’ doesn’t quite cover it. The story is enticing and immersive. The game play is exciting and incredibly well developed and the looks and sounds are, at times, breathtaking. This is a beautifully polished game with an enjoyable, if slightly unnecessary, slice of multiplayer cake thrown in on the side. Tomb Raider fans will not be disappointed with this title and gamers in general will find a lot to love about Lara’s most recent adventure. Raiding tombs has never been so much fun. Fantastic review! It’s hard for adventure games to stand out from the rest of the pack when there are so many good ones. (Examples being Uncharted and Assassin’s Creed) It’s good to hear that Tomb Raider is able to differentiate itself and stand as a fantastic game. I look forward to playing it in the future.